HUGE FIRES THAT forced mass evacuations of residents and holidaymakers in southern France were “under control” early this morning, firefighters said, although they warned new blazes were still starting. 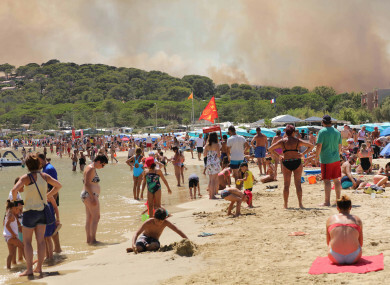 In the village of Bormes-les-Mimosas, located near beaches popular with tourists on the Cote d’Azur, “the fire is not completely under control but we are winning the fight,” said Lieutenant-Colonel Michael Bernier, the civil security officer leading the emergency effort there. “Things are going in the right direction but new fires are starting caused by gusts of wind,” he said. In the neighbouring Bouches-du-Rhone region, three major fires that have burned across thousands of square kilometres were also tamed or being dampened down today, firefighters told AFP. Authorities were on high alert, however, fearing that new blazes could start in the hot, dry conditions, fanned by the strong Mistral wind. Around 10,000 holidaymakers and residents were forced to flee to the safety of public shelters overnight on Tuesday as flames swept towards campsites. Prime Minister Edouard Philippe visited an accommodation centre for evacuees in Bormes-les-Mimosas yesterday evening. Forest fires also raged early today in Portugal, cutting off roads in the centre of the country and forcing thousands to flee just a month after deadly blazes left more than 60 people dead. The biggest fire was in Serta, in the Castelo Branco region, where more than a quarter of the country’s firefighters were attempting to halt its progress. Email “'We are winning the fight': Fires that forced mass evacuations in France almost under control”. Feedback on “'We are winning the fight': Fires that forced mass evacuations in France almost under control”.